It seems like Indian rally stages are finally getting used to the sight of the massive SuperXUV yumping its way through to victory at the 2013 Indian National Rally Championship. This time though, Gaurav Gill and Musa Sherif had some stiff competition. No, it wasn't from someone in their own camp, nor was it from Amittrajit Ghosh who has been winning the 2000cc class of the INRC the past two rounds. 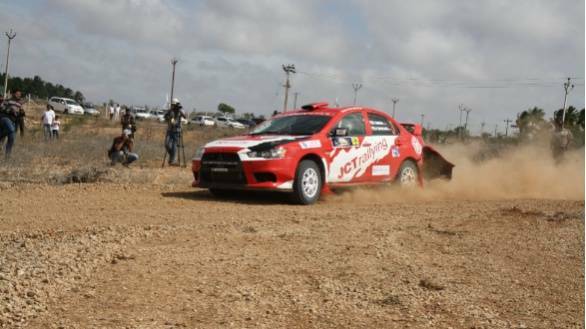 This time Gill's opposition came in the form of Samir Thapar (co-driven by Vivek Ponnusamy) in his Mitsubishi Evo X. Of course, Gill competes in the SUVNRC, while Thapar competes in the IRC category. Nonetheless, they all want to be the fastest car of the rally, don't they? "I wanted to bring a car down to India that hadn't been seen in rallies before," says Thapar of his decision to bring down the Evo X, that most iconic of rally cars. A decision that seems to have paid off given the timings that he set during the first and second stages of the rally. However, a mechanical problem during SS3 meant that he was only able to drive in first gear through the stage. 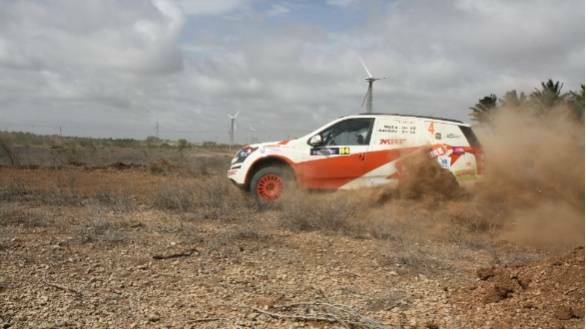 Thapar also accrued a time penalty for a late check in, which meant that he lost the lead in the rally. His timing at the end of Leg 1 is 1:06:34.9. Gaurav Gill, with an overall time of 1:05:13.4 moves to the head of the timing charts. It wasn't all smooth running for him, though. "We noticed at one point that our engine was overheating, so we needed to back off a little and take things easy." Taking things easy didn't mean that they gave up the lead in the SUVNRC, or the rally either. Heading the INRC 2000cc class is Amittrajit Ghosh, who seems to be making it a habit of winning his class. After the victory at Chennai and Nashik, Ghosh looks all set to make it three wins of three rallies. In the INRC 1600cc class, it was a dominant performance from Vikram Mathias in the first two stages. However, a small mistake in the pacenotes in SS3 meant that Mathias and co-driver Chandramouli had to retire for the day. They will continue the rally tomorrow. Lead in the 1600cc class thus goes to Arjun Rao Aroor and Satish Rajagopal. Meanwhile, Suhem MK and Jeevarathinam J lead the JINRC. With two stages and the SSS set for tomorrow, this is going to make for one close rally.